Choice "Outstanding Academic Title, 1999"
It is estimated that more than 75 million food-related illnesses are recorded in the United States alone each year, resulting from a variety of causes—from undercooked fast-food hamburgers to chicken contaminated with salmonella. Food safety has become a daily concern. Today there are added worries due to increased potential for food contamination on the global market, the prospect of terrorism against the food supply, and the lack of adequate regulation of food products and handling. 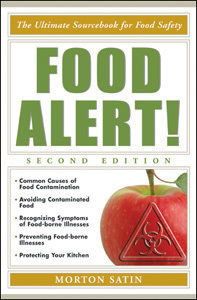 Written by renowned food expert Morton Satin, Food Alert!, Second Edition provides a comprehensive examination of the causes, dangers, and prevention of food-borne diseases. Up-to-date information on inadequate reporting of food-borne disease incidents. Other invaluable features include a special reference section covering all of the potentially dangerous diseases and bacteria caused by food; an appendix of food-borne illnesses by symptom; and helpful resources such as organizations, periodicals, and Web sites. "...a well-organized ready reference for students, public health officials, chefs, restaurant managers, food manufacturers, homemakers, or anyone dealing with food...[an] authoritative sourcebook. Highly recommended." "Accessibly written and extremely well-organized, this [book] is recommended for general collections."